St Petersburg in Russia is a fascinating place to visit as part of a river or ocean cruise holiday. As you sail along the River Neva to approach the port and your terminal you will encounter a thought provoking mix of old and new Russia. The port and terminal area is the St Petersburg Sea Facade, built on land reclaimed from the River Neva. Although it can be an expensive city for hotels, with some research and advance or last minute reservations, you should be able to find some good deals. St Petersburg hotels allows you to extend and enjoy your cruise visit to Russia for a few days longer. Hotels are becoming increasingly modern and there are now many options from budget youth hostel style hotels, through to mini-hotels and the more luxurious. Many hotels are housed in the grand homes of the old aristocracy of Tsarist Russia, such as those found on Nevsky Street. Deals found in city center hotels will give you rooms with great views of the Hermitage and Cathedral. 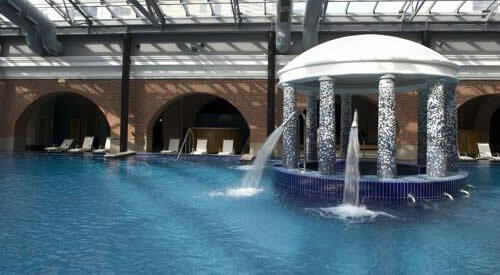 Look for deals that include extras such as breakfast and the use of a gym or Spa and give yourself a pampering treat. 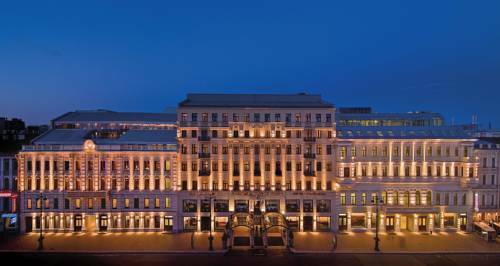 Located along the Neva River banks, within walking distance of the city centre. 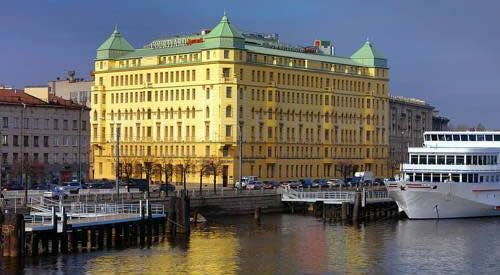 Very popular 5-star hotel situated on Vasilyevsky Island. Lovely 5 star, luxurious property located on Nevsky Prospekt, close to nice restaurants and subway trains. Vessels can dock at several different piers. Larger cruise ships tie up at the Marine (Sea) Facade complex. This facility located on the River Neva is capable of holding several large cruise liners at once. Despite the large number of port arrivals, however, movement through the terminal buildings always proceeds smoothly. Facilities at the passenger port include information desks, ATMs, shops and cafes. At the port and terminal shops you can buy typical Russian souvenirs such as iconic nesting dolls. You will also find good deals on porcelain, amber jewelry and icons. Marine Facade is located a few miles or kilometer north-west of the city centre. Smaller ships are able to sail up the Neva river and dock at either English Embankment or Lieutenant Schmidt Embankment, which are much closer to downtown St Petersburg Russia. Cruiselines operating from the port include Princess Cruises and MSC Cruises. Itineraries often include the port of Stockholm, Denmak’s capital city Copenhagen, upscale Warnemunde in Germany and Oslo in Norway. St Petersburg was founded by Tsar Peter the Great in 1703, on reclaimed swampland alongside the River Neva. It became a glittering city of onion-shaped domes and sumptuous palaces. All visitors to St Petersburg must visit the Hermitage with its world-class collection of art and treasures. Your cruise ship itinerary may include a guided tour of this, taking you direct from the terminal and hopefully, avoiding some of the worst crowds at this very popular destination. St Petersburg remains the cultural capital of Russia and as you move around the city you will find yourself frequently stopping to admire the wonderful art and architecture all around you. Other highlights, such as the Museum of Russia and St Isaac’s Cathedral are all just a short walk from the Hermitage. St Isaac’s Cathedral is an awesome collection of mosaic murals and marble floors topped with a gold dome. Look out for special deals on trips that take you to some of the magnificent Romanov palaces that surround the city or on a romantic twilight cruise along the River Neva. Pulkovo Airport : main international airport of the city, located just over 20km or 14mi from central Saint Petersburg. Currency in Russia is the Russian Rouble (RUB). There are ATMs available in the cruise terminals at Marine Facade. The official language is Russian. English is spoken in tourist spots.